The Quick Sling Cross-body Camera Strap from Case Logic provides you with a quick and efficient way to carry and use your camera. It's designed to be worn cross body but can also be carried over either shoulder. When not in use, the strap hangs by your side. The swivel hardware has a loop that screws to your camera's 1/4-20 tripod socket. The strap is threaded through the loop so that when you want to shoot, the camera glides smoothly along the strap and up to eye level. Box Dimensions (LxWxH) 7.6 x 3.8 x 2.5"
Quick Sling Cross-body Camera Strap is rated 4.3 out of 5 by 39. Rated 3 out of 5 by James R. from Does what it says Handy strap across body gives quick access to your camera. Nice padding on shoulder. However, the screw attachment on the strap that you use to screw into the tripod mount on your camera is rather bulky and not flexible. Therefore, if you want to put your camera with strap into a camera holster bag, it probably will not fit. You will have to detach the strap first. Rated 4 out of 5 by Shawna from Love It Pros: -Really easy to use and to attach to your camera -Very convenient; it is a nice way to keep your camera at your side when not in use, but still have quick access to it for shooting -Comfortable; doesn't hurt your neck after awhile like a normal camera strap does Cons: -The shoulder padding tends to slip down off your shoulder and down onto your back instead. Not a big deal since you can just rotate it back up, but worth noting. Rated 5 out of 5 by Craig from Way more comfortable than my stock strap I like walking around and having my camera slung around me for long periods of time. My last trip I took, which was in San Francisco, I had my camera around my neck for about 14 hours straight. Needless to say the included strap with my camera became quite uncomfortable after only a few hours let alone the whole day. This quick-sling type of strap makes it much more comfortable to have your camera with you if you like carrying it around your neck or shoulder as I do. The shoulder strap is bigger than my stock strap, however, it takes so much strain off of your neck. The attachment that screws into your cameras mount makes it nice and quick to have your camera in your hand and at your ready. So far I'm extremely pleased with this strap and have nothing bad to say about it. It'll really get full use this coming spring and summer so I'll be able to really tell how reliable this thing is. I definitely recommend the Case Logic Quick-Sling Strap. Rated 3 out of 5 by Stephen S. from Works as intended, but... I like having a strap that doesn't strain my neck. My only complaint is the size of the screw attachment - it's a bit bulky. It's a tight fit in my camera bag and when I want to use a tripod, I have to take it off. I'd like to see one that attaches to the top of the camera (where the original strap attached) and not to the tripod attachment. Rated 5 out of 5 by Smitty from Excellent strap I really like this strap. It performs as promised and is easy to use. The wide pad is very grippy and will not slide off your shoulder. Very reasonably priced. I fasten the lower end to a belt loop with a small carabiener to keep the camera from swinging around while climbing. Rated 4 out of 5 by Alex from Great strap for price I bought this for my mirror less camera. I didn't want to spend another $60 on a black rapid so I bought this case logic quick strap. It is comfortable, easy to use and cheap. It slides around sometimes but for the price it can't be beat! 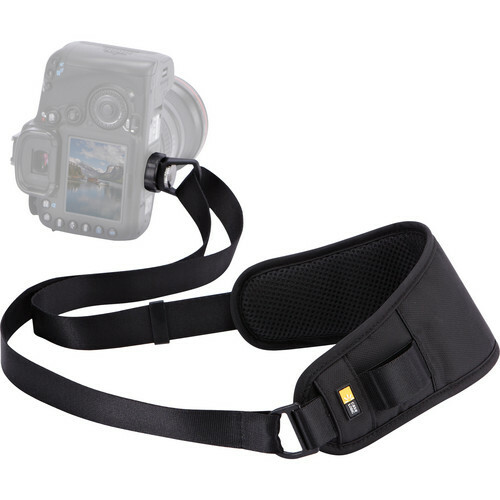 Rated 5 out of 5 by AshleyD from Great product, good price I bought this product because the strap that came with my camera just wasn't doing it anymore especially since I've started to shoot more. I prefer this one because the cross-body strap is much more comfortable and there's less of a chance that I'd bang my camera against something since it's out of the way. I was also pleasantly surprised with how fast the strap arrived. Rated 5 out of 5 by Leah Photographer from extremely satisfied with this product I'm an children's photographer and I am very satisfied with this product. its comfortable and easy to wear when running after children. It met all of my expectations and I would definitely recommend it. Is there a chance that the camera tripod mount can get cracked or break due to constant change of strap and tripod?? The tripod mount on cameras is designed for frequent interchanging of tripod quick release plates and other threaded accessories and it will be extremely unlikely that any damage will be caused from changing between straps and tripods. What is the total length of this camera strap (I am tall so need a strap longer than most people. This strap is 14.4 long. Is it possible to purchase just the mount on this strap? Unfortunately, the mount piece is not sold as a separate item. Is this strap adjustable for length? Yes, the Case Logic Quick Sling Cross-Body Camera Strap is adjustable. How long is the entire strap ( screw-to-screw )? And don't say it is 14.4 , that can't be because that would be as long as the forearm of a mid-sized male. The information in the specs is misleading here. Can I replace the screw-mounting adapter that connects to base of camera with my own customer adapter (or is the strap a continuous loop such that this is not possible)? Hello, I really do not know, everything is cooked and I would not know how to disarm it, although I imagine it can be done, but I do not know if it's worth it, it has worked well for me until now. What is the minimum length of this camera strap? (I'm short). Can you have a tripod attachment as well as the attachment for the item attached to the camera simultaneously? As said before the sling uses the tripod mount and is fixed there with a screw. That works well and for the proice the sling is perfect. It also folds into a small and lightweight package for travel. I Have used it on a combination with a telelens, that has a tripod mount. There I used the cameramount for the sling and the lensmount for a monopod.